The victim Curtis Cail was previously arrested and charged with murder in connection with the shooting death of a man in 2012. 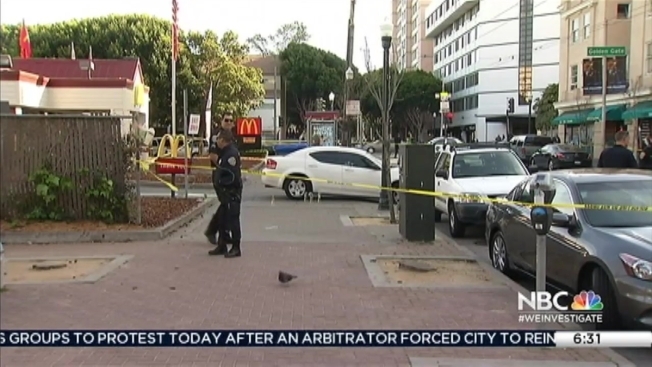 A man, accused of murder in a 2012 shooting, died of multiple gunshot wounds Sunday outside a McDonald's in San Francisco's Western Addition neighborhood, according to police. The San Francisco Medical Examiner on Monday identified the victim as Curtis Cail of San Francisco. The 23-year-old was previously arrested and charged with murder in connection with the shooting death of James Earl Lee, 54, in May 2012 on the 1100 block of Turk Street. A suspect, who is still at large, gunned Cail down around 2:45 p.m. at the Golden Gate Avenue and Fillmore Street restaurant, San Francisco police said Sunday. The attacker fled the scene while a witness said he jumped out of the way after hearing about five or six shots, police said. The door and window of a white Dodge sedan were also pockmarked with bullet holes. Police say the victim was seated in the passenger's seat and tried to crawl out of the car when the shots were being fired. The driver, who survived, is cooperating with police. The McDonald's in question is just a block or so away from the police department's Northern Station, but that didn't deter the assailant Sunday. "It shouldn't be happening, first of all, because the police station is right next door," said Omar Nazeer, who works at a restaurant nearby. "It should be safer, but it's not. The shooting also disconcerted police officers. "It is in the middle of the afternoon, and there was a lot of pedestrian traffic and a lot of motor vehicle traffic," said Officer Anthony Manfredi. "So, it was very brazen. Unfortunately, it's not the first time it's happened here." A witness, who asked to be identified by first name only, said the spray of bullets caused chaos on the streets. "I didn't look back," T.J. said. "I just ran and knocked people out the way and I just dove." Responding officers found Cail face down, police said, and rushed him to San Francisco General Hospital. However, he did not survive. Court officials could not immediately be reached to determine the outcome of the 2012 case. A second victim, a 27-year-old woman, was also shot that day but survived, police said. Along with Cail, then 33-year-old Kenneth Chappell was charged with murder, attempted murder and other offenses.